Director Rama Burshtein offers a candid glimpse into Israel’s ultra-Orthodox Jewish community in her debut feature 'Fill The Void', a tender love story with tragic beginnings and a rather disappointing conclusion. Hadas Yaron stars in the central role as Shira Mendelman, an 18-year-old girl full of giddy excitement at the prospect of meeting her match and getting married. Shira’s dreams are dashed, however, with the sudden death of her pregnant sister. 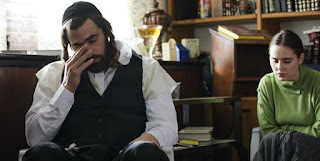 Heartbroken, Shira’s mother (Irit Sheleg) urges her to marry her widowed brother-in-law, the aloof and considerably older Yohai (Yiftach Klein) in an effort to keep the family together. Burdened by a sense of responsibility and obligation, but also protective of her romantic ideals of marriage, Shira grapples with the decision over whether to marry Yohai and assume the role of mother to his newborn son – a decision that forms the basis of the film. Burshtein lovingly depicts the many traditions, rites and ceremonies that surround this Jewish community, romanticising rather than criticising – often with charming touches of humour. With very few exterior shots, the vast majority of the scenes take place in crowded rooms, often dreamily half-lit, creating a soft Vermeer-like effect that works well to reinforce the sense of the sheltered social bubble in which Shira lives. Commendably, Burshtein avoids well-worn tropes, furnishing her characters with complex motives and conflicts. Shira’s mother isn’t simply domineering or selfish; her judgement is also clouded by grief. Similarly, Yohai isn’t a consummate charmer; neither is he an oppressive villain – and Shira isn’t just a simpering innocent. These complexities are played out very well by Sheleg, Klein and Yaron, who all deliver emotionally intense, nuanced performances. However, whilst 'Fill The Void' does have its merits, I found the will-she-won’t-she melodrama of it all slightly wearing and tedious, particularly as not much actually materially happens in this slow-paced story. Similarly, the strained, repressed interactions between the characters do begin to grate. Terse, minimal exchanges underpinned by simmering emotion are all very well, but they also make for long silences and lots of reading between the lines – and that may be slightly too much void-filling to expect from an audience. The anti-climactic ending certainly left me feeling a bit empty. 'Fill The Void' is screening at the 56th BFI London Film Festival, with a final showing tonight at 9pm. For more info and to buy tickets, head to bfi.org.uk/lff.